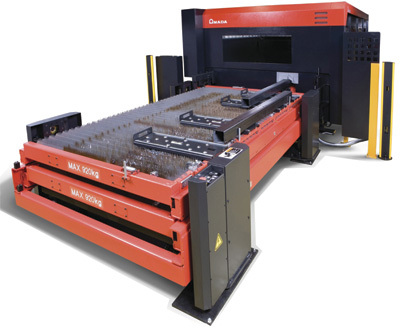 Amada America, Inc., Buena Park, CA, has expanded on its FOM2 laser-cutting system by adding an innovative rotary index that fabricators can install on one of three interchangeable shuttle pallets, making it easy to switch from flat-sheet cutting to tube or pipe cutting. With the rotary index, Amada’s FOM2RI-3015 cutting machine can process round, square, rectangular, C-channel and angle iron to 441 lb. Additional productivity can be achieved using Amada’s Dr. Abe Tube software, loaded with preprogrammed shapes and configurations so that fabricators can manufacture tubular structures that fit together precisely for welding. The rotary index is an integrated unit, allowing the cutting head to be positioned near the controllable pneumatic chuck, minimizing the dead zone. Bowed pipe or tubing can be cut without vibration while maintaining accuracy from end to end.